The Redwood RB5 B15 Beginners Bass Guitar and Amp Pack is ideal for newcomers to the instrument, and is a fantastic gift idea for your loved one. Yhe pack provides a solidly built bass guitar and amp, as well as all the accessories you could need to get started. The pack includes: a Redwood RB5 bass guitar, a Redwood B15 bass guitar amplifier, a guitar strap, guitar bag, an instrument cable, a chromatic tuner, and a pack of guitar plectrums. Grab yours and get playing today! The Redwood RB5 is crafted using alder, a lightweight and tonally balanced wood that is perfect for comfortability and versatility. The deep double-cutaway body profile has curves in all the right places, with weight distributed evenly across the body and neck to provide a balanced playing experience. The bevelled edges remove any discomfort so that whether you wear it high or low, you are treated to a snug feel every time. Fitted to the body using a sturdy bolt-on construction is a durable hardwood neck. The neck offers a generous 34-inch scale to maximise sustain and provide a generous playing area to explore. Paired with the neck is a smooth blackwood fingerboard, home to 21-frets that offer a luxurious feel as you play. The character of the tonewood shines through thanks to the simple to use yet highly versatile split single-coil pickup. Control comes in the form of master volume and tone pots, which allow you to shape your output with considerable complexity for a wide range of tones. The Redwood B-15 bass guitar amplifier is a little powerhouse that allows you to practise, jam and perform in style. Thanks to the built-in handle and compact size, it’s easy to carry with you, and the corners are covered with hard plastic to protect the amp during transit. The B15 boasts an impressive 15-watt output that sings via the 6.5-inch speaker, with a range of controls that include a 4-band EQ, and master volume knob. Shaping your sound can be done easily, so that you can tailor your output to the musical style you're trying to master, or suit the environment that you're performing in. The Redwood B-15 Bass Guitar Amplifier has been equipped with a 1/4-inch / 6.3mm output jack for connecting a pair of headphones. With the headphones in, the amp’s speaker is muted, allowing you to play whenever you wish without disturbing the neighbours. 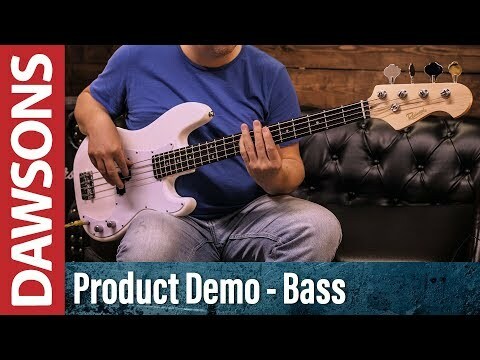 The Redwood RB5 B15 Beginners Bass Guitar and Amp Pack is proof that an instrument that plays well, sounds great, and is built to last, need not cost the earth. With the B15 amplifier and accessories included, you have everything needed to get your career off to a flying start. Posted on 23/03/2019 by Bazzles Total bargain for the price. It’s heavy but then it’s a bass. Well balanced and pretty well set up to play out of the box. Great overall finish and the amp is LOUD. Like seriously. It’s loud. Anyway. All in all it feels and plays like a lot higher end guitar in my opinion. Brilliant for new players (with big hands. It’s a stretch) or as a good back up bass if you’re a little more experienced and doing gigs. Although you might want better pic ups if you’re gigging. Ain’t tried it so can’t say but it’s an entry level bass so. But yeah hundred percent worth the purchase. Also. Dawson’s deliver stuff quick! Great service. Already a repeat customer and will remain so too.